Chicago, 2035. 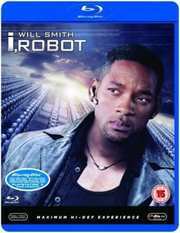 Techno and robophobe Detective Agent Spooner (Will Smith) is appointed to investigate the alleged suicide of friend and father of modern robotics, Dr. Alfred Lanning (James Cromwell). At a time when robots have become commonplace in homes, Spooner suspects robots have turned against Lanning`s first law, "A Robot Must Not Harm a Human Being" and that the suicide may in fact be murder. When Sonny (Alan Tudyk), a robot that has been taught human emotions, runs from the scene of the crime, Spooner enlists the help of ice-cool robot psychologist Dr. Susan Calvin (Bridget Moynahan) to track him down. Spooner deduces that scientist Lanning has left a trail of clues and has reprogrammed Sonny to help them uncover a suspected conspiracy. The events that follow lead them right to the heart of the multimillion-dollar corporation, U.S Robotics for an awe-inspiring showdown! Commentary by director Alex Proyas and screenwriter Akiva Goldsman. Day Out of Days: The I, Robot Production Diaries. The Filmmakers` Toolbox and Visual Effects.